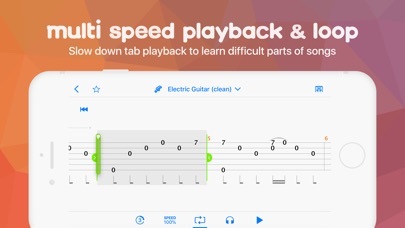 Featured in the Wall Street Journal as one of "The Best Apps for Learning to Play Music" and as the Apple App of the Week, Songsterr gives you instant access to 500,000+ high quality guitar, bass and drum tabs & chords. 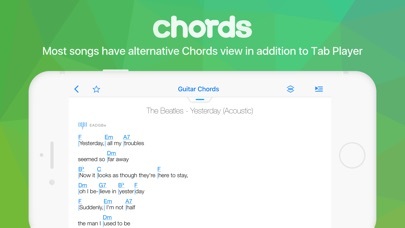 Songsterr Tabs & Chords is a subscription based app. Free version allows you to check out all the features using 15 second previews of songs. To get unlimited access to all the songs, sign up for a $4.99 USD per month subscription (pricing may vary in countries other than the U.S.). If you are subscribed to paid plan on songsterr.com website, sign in from within the app to get the subscription free of charge. 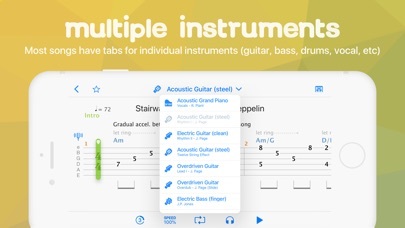 FEATURES Tabs & Chords • Huge catalogue of 500,000+ accurate tabs & chords. • High transcription quality. There is only one version of tab per song. • Legality. Music creators get paid. 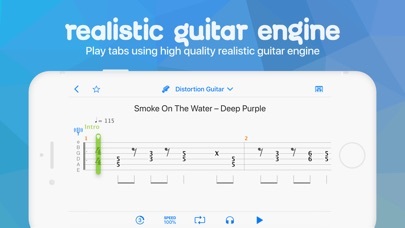 Tab Player • Realistic Guitar Engine. Learn and play along with Songsterr. • Multiple Instruments. Most songs have tabs for individual instruments (guitar, bass, drums, vocal, etc). • Speed Control. Slow down tab playback to learn difficult parts down to 15%. • Loop. Play back selected measures over and over again. • Offline Mode. View and playback previously opened tabs offline. Cache size can be controlled via Settings app. • Solo. Hear just the instrument you are learning. • Count in. Gives you time to prepare for playing after tapping Play. 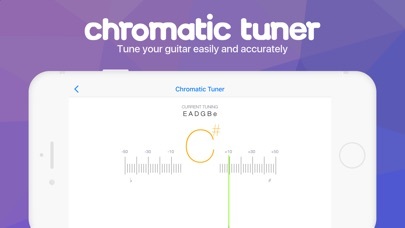 • Chromatic Tuner. Tune your guitar via mic or adaptors like iRig. • Background Audio Support. Play along using e.g. iRig and Amplitube (make sure that "Background Audio" option is enabled in Amplitube) Navigation • Instrument Filter. Filter out songs that don't have tab for your instrument. • History. Instantly access tabs you viewed recently. • Favorites. Quickly access your favorite tabs. • Favorites Syncing. Sign in with your songsterr.com account to synchronize favorites with website. Price • Universal. iPad and iPhone. One app, two platforms, one subscription. Your Songsterr subscription will automatically renew each month and your credit card will be charged through your iTunes account. You can turn off auto-renew at any time from your iTunes account settings. SUBSCRIBERS’ AUTOMATIC-RENEWAL FEATURE: Your subscription automatically renews unless auto-renew is turned off at least 24-hours before the end of the current period. Your iTunes account will automatically be charged at the same price for renewal within 24-hours prior to the end of the current monthly period unless you change your subscription preferences in your account settings. You can manage your subscriptions through your Account Settings after purchase. No cancellation of the current subscription is allowed during active subscription period. Please go to http://www.songsterr.com/a/wa/privacy and http://www.songsterr.com/a/wa/terms for more information. You should at least let me review a complete song before pay for the subscription. Man ? I just cannot pay for it because I cannot even try for a single song .